This is one of my most tried-and-true red velvet cakes. It’s similar to the original Waldorf Astoria Red Velvet Cake, but uses butter instead of shortening and cake flour instead of all-purpose. Compared with some other recipes it has less fat, but is still moist if you use the correct type and amount of flour. What I like best about this cake is its traditional red velvet flavor. That is, it has just the right amount of chocolate and more “red velvet” flavor which is kind of a mix of buttermilk, chocolate and vanilla. I adapted this recipe from Aunt Mildred’s Red Velvet Cake, but it’s also similar to King Arthur’s Red Velvet Cake. What’s different is the frosting. I use cream cheese frosting on my red velvet cakes, but some prefer the fluffy boiled type icing. IF you are looking for that type of frosting, Taste of Home has a good version. Update: Here it is as a sheet cake. Bake time was about 28 minutes. 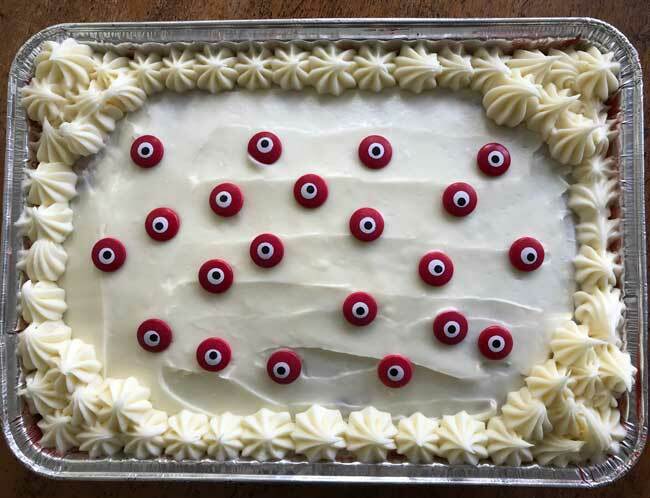 I made this one for Halloween and put candy eyeballs all over it. Preheat oven to 350 degrees F. Spray two 8 inch round cake pans with baking spray. In bowl of a stand mixer or in a large mixing bowl using an electric mixer, cream butter, sugar and salt until light. Add the vanilla and the eggs beating 30 seconds after each egg is added. Make a paste of food coloring and cocoa and add to the creamed mixture. Add buttermilk and flour alternately, beating at low speed until mixed. In a small cup, combine the soda and the vinegar and let it foam up. Pour the foaming mixture into the batter and stir until it’s mixed in. Immediately pour into the two 8 inch pans and bake for 27-30 minutes. Let cool for 10 minutes in pans set on a rack. Flip from pans and let cool completely. Make icing. Beat the butter and cream cheese until smooth. Beat in vanilla. Add confectioner’s sugar slowly, beating until smooth. For a little tartness, beat in some lemon juice. I recommend this one which uses a combination of cake and all-purpose. It’s my favorite at the moment. Do you most recommend making this version or your cake flour version? Hi, i’m from Malaysia.. I had problem with my red velvet cake this few days, it tasted a bit bitter.. Is that normal? Can anyone help me with this matter? By the way, i used a bottle of red food colouring but it turned out dark red.. 🙁 I can’t find buttermilk overhere, so I used a cup of milk with 1tbsp of white vinegar.. If we add extra vinegar, can it reduce the bitter taste in cake? I really hope anyone can give me any suggestion or solution.. thank you in advance..
Gale, thanks for the comment! Cake newbie here, this is my 2nd scratch cake and it turned out FABULOUS! Thank you so much for the recipe and the clear directions. It came out moist with just that hint of chocolate, we were all very impressed with the result. I lessened the sugar in the icing and had so much left over that I dyed the leftover batch and made more squiggles on the cake. I’m going to try making your breakfast carrot cookies in a few days. I’m so excited! 🙂 Appreciate your site so much! Hi Esther, if you don’t want to use 2 oz of food coloring, I recommend you try a different recipe. I have one recipe that I’ve been meaning to make but keep forgetting about. It’s a red velvet cake made with beets. Maybe you could make this one? It does call for a teaspoon of red food coloring, but that’s a lot less than 2 full oz! For some reason, I don’t like using recipes that don’t provide a picture. Weird right? Anyway thanks for stopping by my blog, I really appreciate it. Btw, I really should invest in 2 8 inch cake pans and one more 9 inch cake pan… Oh and just wondering, but what would happen to the cake if I left out the food coloring, other than the lack of redness. I’m just worried that too much food coloring is bad for the body. Thank you for the recipes. I have made red velvet cake a few times and I love it. I have a question, though….being in Canada, this is not a common cake and a few of my friends and I are having an argument. If you use the no-taste red-dye, is it still really Red Velvet cake? Will the flavour be the same? Or is it just a chocolate cake that is red? That looks so good!! 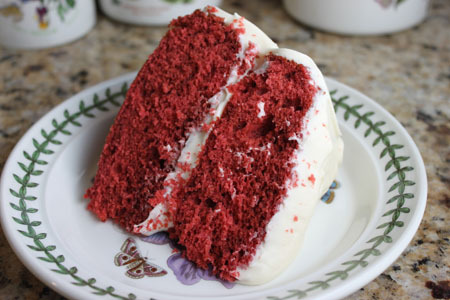 I just love the red color of a red velvet cake! I don’t know why I’ve never made a red velvet cake! What’s my problem? This one looks super…copying the recipe now. I bought a bottle of red food coloring after your last red velvet kick and still haven’t gotten to it. Gonna have to do it. What’s funny is I just made red velvet cupcakes tonight wtih a Paula Deen recipe that is very similar. I know that Wilton makes a no-taste red – it can be difficult to find, you might have to get it online, but if you are really sensitive to the red color taste, that might be a route to try! I always am disappointed at a bitter after taste from red food coloring in Red Velvet Cakes. Any idea how to avoid that? I’m not sure that I have ever actually eaten a red velvet cake. I certainly have never baked one. The recipe looks interesting, I may have to give it a try. Shelley, I hope you try this one. If you do, let me know what you think. Also, thanks for being patient with my site today. We’re having problems with the hosting provider and it’s loading really slowly. Hopefully it will be fixed soon. Looks delish. I’ve yet to find a Red Velvet cake recipe I like. Might have to give this one a try. Thanks for sharing!